Since the boys were in kindergarten, we’ve done math on the white board or math on scratch paper or math with me scribing or math in workbooks or worktexts or with manipulatives. But when Mushroom reached pre-algebra this year I realized that what we had not done was math neatly laid out in a notebook. It was a mess. However, I was patient. I gave Mushroom a special notebook for math to keep it separate for the first time from the rest of his written work and made him a special cover for it. 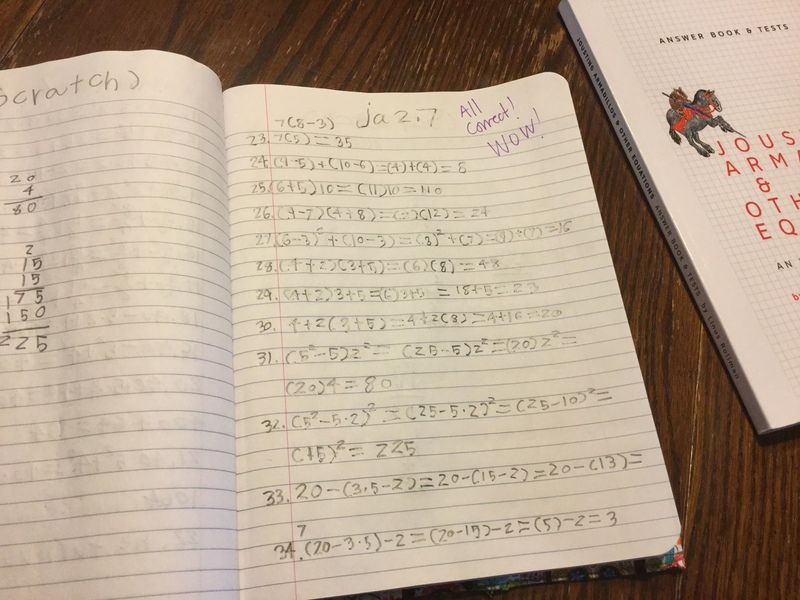 Then I tried to instill in him to label the top of every page: the lesson number or “Scratch.” Then we got to simplifying expressions and I explained that you have to copy the expression at the start. He looked nigh on devastated. And the notebook was a mess. Math is so much about the process. However, there comes a point when the process is hurt by sloppiness. We try really hard to focus on what matters more than how it’s dressed in our schooling. So the quality of the writing matters more than the spelling, that you worked on art for an hour matters more than whether you ended up with a finished product, that you got the right answer matters more than if you forgot to write the units next to it. However, eventually, some of those things matter sometimes. I told Mushroom he had acquired a lifelong skill by being able to keep his math notebook neat and functional. But I’m also glad I didn’t try to make him acquire this skill earlier. It was pretty painless at this point while it would have been difficult for him earlier. So I’m glad I waited for the right moment to worry a little more about how it looks. I remember the first time I encountered Cuisenaire rods in a graduate workshop. “Be sure you allow time for kids to play with them,” began the instructor, looking around at a room full of educators turning the tiny blocks into towers and patterns of stripes. As we knocked over towers and tried to pay attention to the instructions on how to use these colorful little things with students, we laughed. Even the adults were drawn to playing with their math. I’ve since learned that there are a million ways to play with your math and hold it in your hands. It’s not a necessary step for absolutely every student, but for most, it makes math more fun, more tactile, and easier to understand. 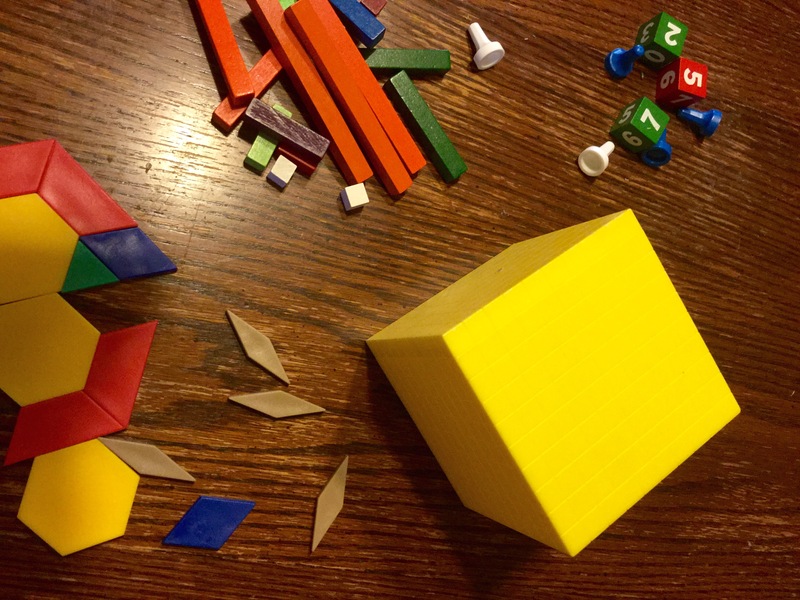 Math manipulatives can be a lifeline for some math strugglers, a shortcut to understanding for some thinkers, and a means to get to a deeper understanding for others. There are dozens of different products out there for both arithmetic and geometry and even an array of products for algebra. There are also ways to make math hands on by bringing it into the real world in other ways. You can find the rest of my post as well as any discussion that arises from it here. We had never covered probability, so I felt like it was time to dive in with a little bit of a focus. Now that we’ve done a good bit of it, I feel like we would have been fun and totally possible to have done it a few years ago as well and then returned to it with a stronger focus before moving into pre-algebra. It’s one of those topics that’s not really covered in books for younger kids, yet kids are constantly encountering probability in their lives, in part because of games. I think it makes a huge amount of sense to cover it earlier. 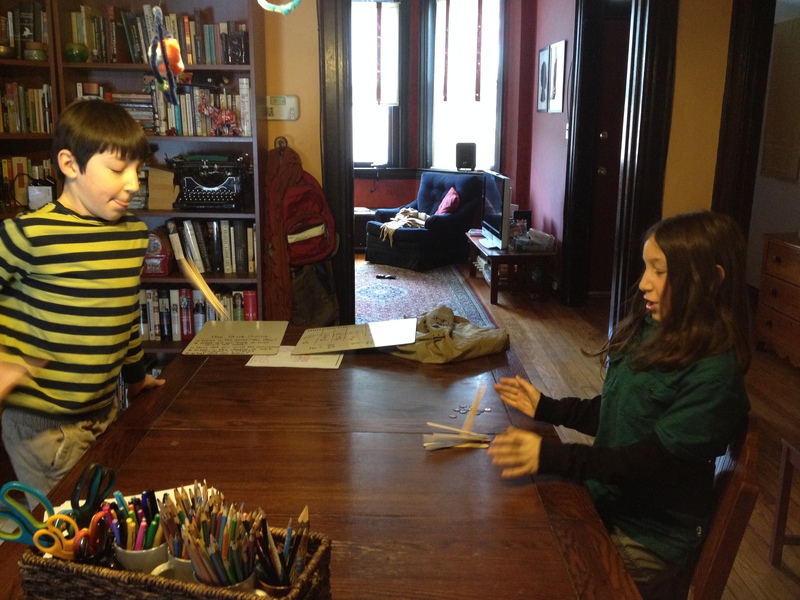 Throwing game sticks in an activity from the GEMS Guide. There are a couple of good picture books for younger students about probability. The first is the MathStart book Probably Pistachio by Stuart J. Murphy. This is really not one of my favorites in the series, but it does introduce the concepts, especially about using probability to predict what comes next. It’s Probably Penny by Loreen Leedy is similar in concept, and readers who like Leedy’s classic picture book about measuring will recognize the same characters. 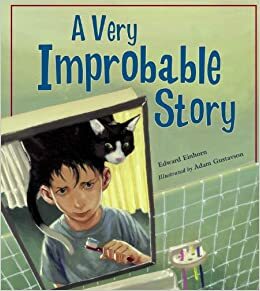 However, my favorite was A Very Improbable Story by Edward Einhorn from Charlesbridge. This one is more clever and introduces a lot more basic vocabulary to start talking about probability, not only for what happens next but also for games. Of course there’s a Murderous Maths book for kids who are just a little older. Are You Feeling Lucky? is yet another excellent resource. We have been loving the Murderous Maths series. This one, like the one about shapes, asks readers to try a number of things out and I think it’s best when you do the activities with the book, such as flipping a coin or rolling a die. The book also covers some combinations math, which is nice for us as a follow up to some of the Beast Academy combinations math. If you haven’t yet discovered the Murderous Maths books, know that they often cover some surprisingly complex and difficult math, far beyond what kids would typically do before high school. However they cover it in such a friendly and humorous way that it feels approachable and enjoyable. The GEMS guide In All Probability is an excellent one. It’s intended for students grades 3-5. I think the activities could be done more quickly for older kids who need an introduction to the subject as well and perhaps beefed up a little. There are five sets of activities that include flipping coins, making spinners, rolling dice, and making game sticks based on a Native American game. I really like the thought behind the GEMS Guides in general, however, as always, you have to adapt them to homeschool use since they’re really set up for a large class. In this book, some of the activities assume that you’ll gather lots of data from the games. Also, I wish the books were organized with the math more clear and more in depth. There is a teacher section in the back that explains the math behind the activities in more depth, but, for example, the number of chances in the Native American game sticks activity is tied to Pascal’s Triangle, yet it never mentions that. Still, I like the way the investigations are set up for real discovery math and Mushroom and BalletBoy both enjoyed building the spinners, making game sticks, and playing all the various games. I wanted some pages to practice probability problems, so I had Mushroom do some of the pages from MEP Math that deal with probability. You can find them in the 5b book at the end of this section and the beginning of this one. An alternate source of probability problems and text could have been the NCERT 7th grade math book chapter on data, which covers a variety of concepts, including probability. You can find that here, if you’re interested. Of course, since probability is in our lives so much, it’s good to look at other places it appears. We started with something greatly revered in our house: game shows. In case you didn’t know, the Husband won us the down payment on the rowhouse many years ago on a game show. Thus the game show’s exalted place in our hearts. It’s fun to look at the odds on nearly any game show. However, the classic game show problem is the Let’s Make a Deal problem, which has been written about a ton, most famously by Marilyn Vos Savant and Martin Gardner (if you’d like to be a math nerd and don’t know who Martin Gardner is, you need to remedy that, by the way). It’s great to actually watch the show and learn about the problem. I saw a great demonstration of it by Ed Zaccaro of the Challenge Math books at a conference once, using envelopes instead of doors. With three envelopes, it’s not clear which one to choose. However, with a hundred envelopes, it’s almost immediately clear. We tried that and talked a little about how probability is one of those things that can be tricky to think about sometimes. This was followed up on nicely by the Murderous Maths book when it talked about how pennies don’t have memories. If you look up probability lessons on Pinterest, you’ll find lots of options. However, the classic probability lesson that I wanted to be sure to do was with M&M’s. There are many variations, but essentially you have students calculate the probability of drawing an M&M out of the bag. The more bags you calculate, the closer you can start to get to what is, presumably, the actual ratio in which M&M’s are actually produced. You’re finding the experimental probability, so this is a good activity to introduce this term. The theoretical probability can also be found just by looking up in what ratios the M&M/Mars company actually makes the M&M colors. It’s slightly different for each type of M&M, but you can find it easily online. Finally, we simply tried to be more alert to probability in our lives, such as in weather forecasts, board games, video games, and random events. It’s nice when kids can see math in the real world, especially when it’s things that aren’t money. Overall, this was a good unit for us.